"You see these quotes that it's the size of Texas, then it's the size of France, and I even heard one description of it as a continent. . . there's not consistency in our idea of its size. It's these hot spots, not one big mass. Maybe if you added them all up it's the size of Texas, but we still don't know. It could be bigger than Texas." Tuesday, April 16, 10:30 am, Edgartown. Join Felix Neck staff for stories, crafts, and turtle time at the Sanctuary. For ages three to five, $5 members, $7 non-members. Wednesday, April 17, 5:00 pm, the Chilmark Library. Come see the documentary film The Lost Bird Project, followed by a discussion of the disappeared heath hen, led by Suzan Bellincampi. For more info, call 508 645-3360. Thursday, April 18, 10:30 to 11:00 am, Tisbury Senior Center. Susie Bowman leads "Signs of Spring: Nature's Unfolding Magic": a short nature program with slides and specimens. For more info, call 508 627-4850. Saturday, April 20, 7:00 to 10:00 pm, Chilmark Community Center. Support the important work of the M.V. Shellfish Group while partaking in good times and better seafood. $1 apiece raw bar, silent auction and music by Johnny Hoy. $25 admission. Wednesday, April 24, 7:00 to 8:00 pm, at the VH Library. Felix Neck's Susie Bowman next heads over to the Vineyard Haven Library for another nature program, this time bringing us "Horseshoe Crabs: A Story of Beach Trysts and Blue Bloods." For more info, call 508 627-4850. For those who took part in the rain barrel promotion offered this year by the Lagoon Pond Association: the pick-up and demonstration location has been changed. It will now be at the A Gallery, located across the road from Eden Market (i.e. still on State Rd., not too far from the original location, SBS). It will be Saturday, April 20 10:00 - 3:00. Additional rain barrels will be available for sale at the pickup location for those that are interested. For more information, see the LPA's flyer. Earth Day is Every Day. . .
. . . but the VCS Earth Day Beach Clean-up is this Saturday, April 20! 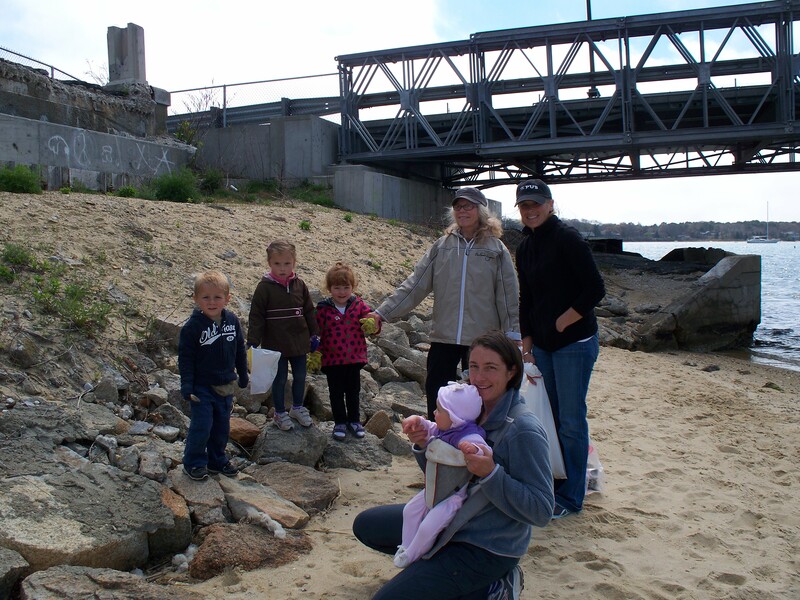 Please join us from 10:00 am to noon at your favorite Vineyard beach for a morning of fun and environmental service. For over twenty years VCS has sponsored this initiative to increase local support for Earth Day and, more broadly, to encourage a greater appreciation and respect for the natural beauty of our Island year-round. Together, we can take responsibility for our Island’s beaches, one of our most precious resources. This year we will be working at 23 beaches; check the list below to find your favorite (or maybe visit somewhere new!). Afterward, head over to the Harbor View Hotel in Edgartown from 12:00 to 2:00 for our traditional (but better-than-ever) post clean-up party, featuring free food, t-shirts for kids (while they last) and be entered in a raffle to take home the beautiful book/DVD/Blu-ray set Oceans, by Jacques Perrin. Cleaning up our planet’s five great garbage patches – incomprehensibly massive collections of tiny bits of degraded plastic formed by large-scale ocean currents – is a popular goal for obvious reasons: they’re deadly to sea life, costly to shipping, and generally represent a disgusting reminder of the waste that inherently accompanies the convenience of plastic. Recently, a new clean-up device envisioned by 19-year-old Boyan Slat created quite a stir. Very roughly speaking, his plan turns normal clean-up methods inside-out, by keeping the apparatus stationary. Long floating booms guide the plastic along, but it is ultimately driven by the gyre currents themselves. Unfortunately, despite the initial enthusiasm, the idea has been firmly rebuked as scientifically unsound by those who would appear to know better. More broadly, garbage patch clean-up through new technology may not be a realistic goal, at least not any direct approach to that likens cleaning the gyre to picking up litter. However, without a brilliant new techno-fix, no amount of pool skimmers or enthusiastic volunteers will get the job done either. So where does that leave us? We could despair, I suppose, or we could accept that we must start at the source and get to work. Don’t let so much plastic get into the ocean in the first place! Reduce, Reuse, Recycle, just in case we needed another reason. But also, just as the science is pessimistic regarding floating contraptions, it brings hope to land-based efforts. According to oceanographer Curtis Ebbsmeyer (from the rebuke piece linked above), the contents of the garbage patches are far from static; about half the material is spit out yearly, eventually ending up in another gyre or on a beach somewhere. Therefore, with beach clean-ups efforts we not only reduce new inputs to the garbage patches but also chip away at what is already there. It really is possible to clean the great garbage patches, but it will be done gradually: through reduced input, collecting the material that’s spit out on beaches, and (unfortunate, but it still counts) processing through the food chain.